I’ve always been intrigued by old things–I guess that’s what led me to the museum business where I make my living. What is it about old things that interests me? It’s partly the challenge of understanding them, of coming to learn why that object looks the way it does, and how it w0rks, and what we can learn from the object about the knowledge embodied in it. When you consider an object from a time when more things were built (made one at a time, or in small batches, often by their users) than manufactured (made in great quantities by someone other than the user), there’s often a great deal of character embodied in them. You can understand some of that character by using one of these objects, but you can learn even more by making it and then using it. 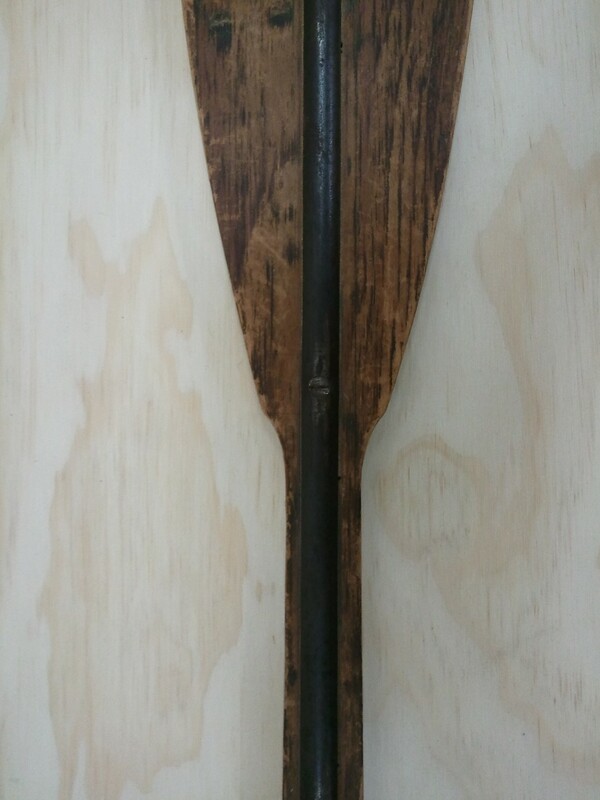 This is what has led me to build some old/new boats, to rehabilitate some old boats, and lately to carve what I’ll call a new (old) canoe paddle. 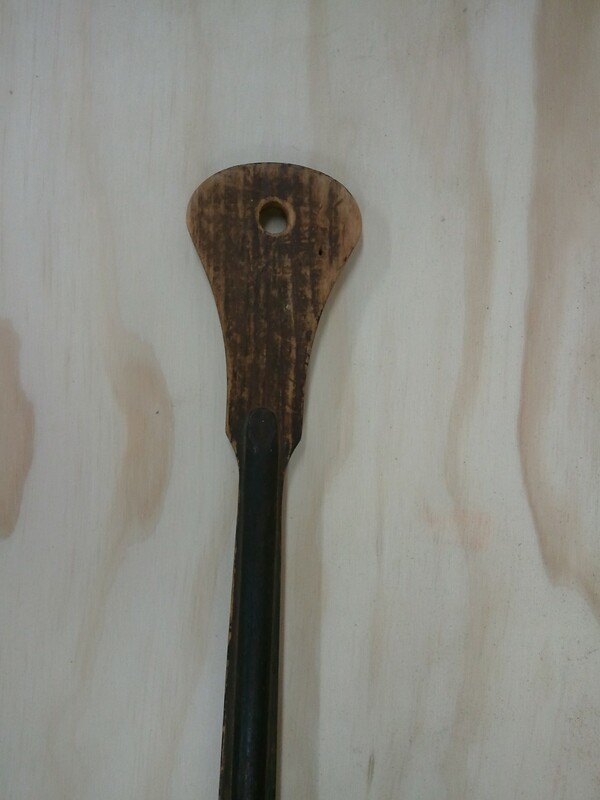 I’m not 100% sure what to call this paddle–“replica” sounds too exacting, claiming a precision that I don’t have. 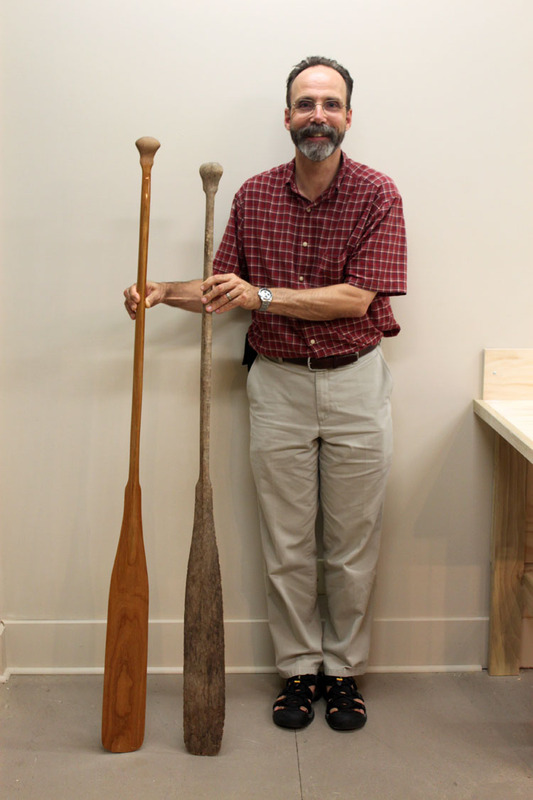 “Reproduction” sounds banal, as in “only a reproduction.” It is just a canoe paddle, but it’s also more than a canoe paddle in that it’s the product of a deliberate reaching back to an earlier era in a search for a design and a style. I rather like the phrase “spirit of tradition” which some of the classic yacht people coined to describe, say, a new build of a Herreshoff schooner that wasn’t a complete copy in terms of materials and techniques but was nonetheless built to the original design and embodied some of its character. 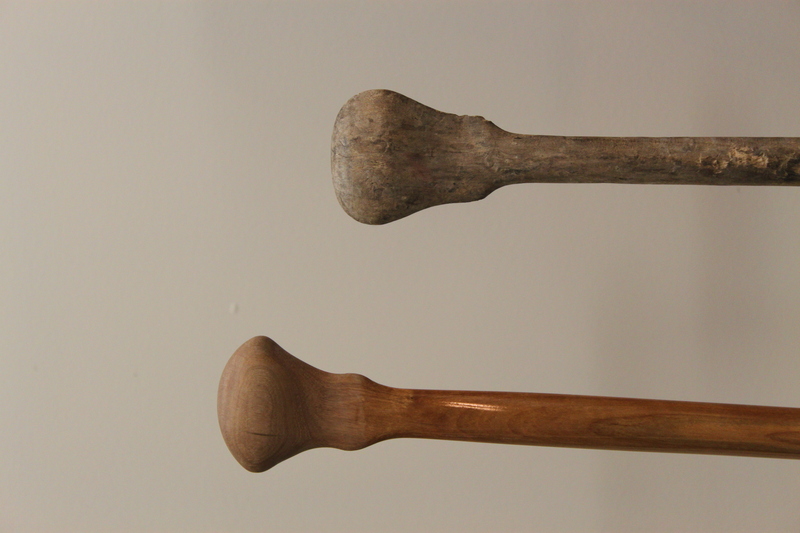 Sometimes these spirit of tradition projects of mine are prompted by the experience of using something old. 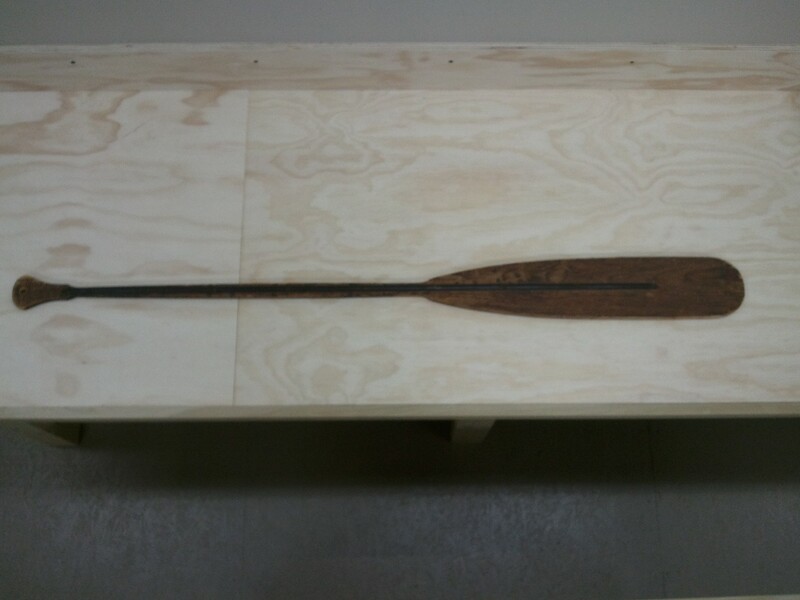 In the case of the St. Lawrence Skiff I built a number of years ago, I had a chance to row an original one and decided right then and there that I had to build one for myself. 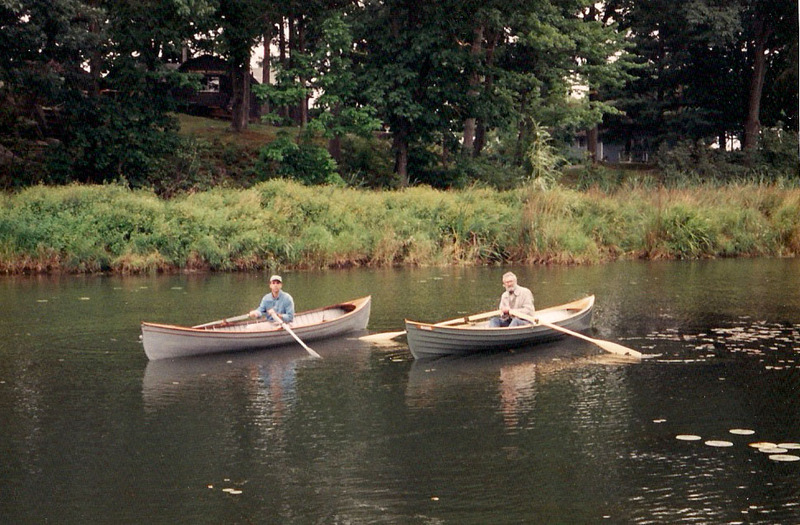 I’m rowing the original on the left, and the owner of the original is rowing my new skiff on the right. 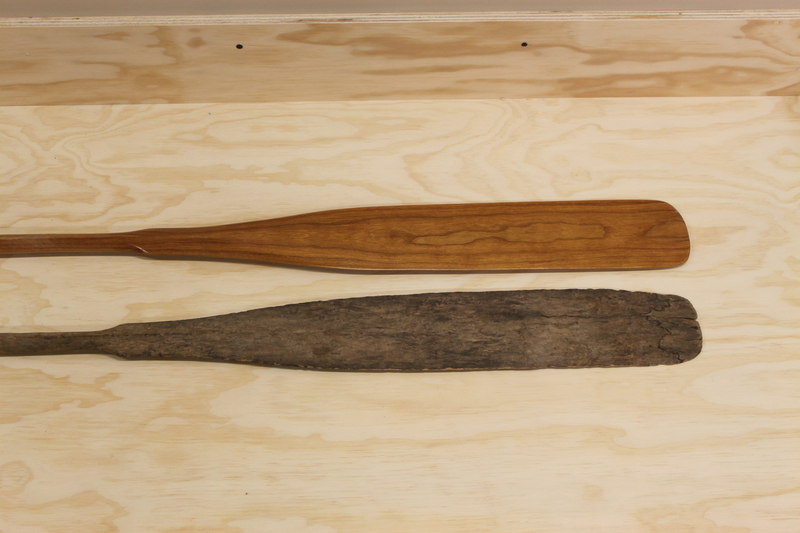 Walker’s workshop also yielded another interesting piece in the form of an old, weathered paddle with a big split in its blade. Though well past its prime, this was a quality piece of work. Carved from birdseye maple, it too had shoulders at the top of the blade and the grip, but was altogether more delicate in its scantlings. The shaft was distinctly oval, especially at the top of the blade where your lower hand would grip it. The story goes that this paddle, dating from the end of the 19th century, had been given to Walker by someone in Burleigh Falls, north of Peterborough. He appears to have made some of this shape for himself, for there were masonite patterns in his workshop. This one really caught my attention, so I traced off a pattern, took it home and found a suitable piece of cherry. Several months and a car accident later, I’ve carved one for myself. The only changes I made were to add a few inches to the shaft, but leaving the blade length unchanged, to make it the right length for me to to draw out and square up some details on the original that seemed to have been worn down over the years. Although I took a 2-D pattern tracing, I didn’t make any other measurements or templates to use when I carved it. I wanted to see how close I could come to the shape of the original working just from the pattern and my initial impression of it. It was an interesting piece to carve. Several times I felt like I’d gone too far, and taken off too much, especially where the shaft meets the bottom of the grip, but when I compared the old and the new I felt like I’d gotten it just about right (except that looking at this photo now, I can see that the “horns” at the bottom of the grip are a little asymmetrical–funny that I never noticed that until now). And what is it like to use? A real treat. It’s light, subtle and just a little whippy in the water, perfect for an evening solo paddle. As pleasant as it is in and of itself, though, for me the enjoyment is greatly increased by its being a new (old) thing. I just might have to make another one.